Carrbridge has something to suit all ages and activity levels. Try an amble through the forest, or one of the more strenuous hill walks. For Munro baggers – take your pick. There is a plethora of offroad bike tracks and winter sports are on offer at the Cairngorm ski-resort. Or why not potter around the nearby villages of Grantown-on-Spey or Aviemore, with shops offering a range of quality, bespoke goods. Carrbridge is renowned, thanks to the famous Golden Spurtle Competition which allows ace porridge makers from across the globe to compete for the title of 'World Porridge Champion'. Come along in October to the village hall and watch last year's stirring champion, Gaelic warbler John Boa from Edinburgh, defend his title. If stirring is not your thing, what about some sawing? Visit the annual Carve Carrbridge competition in September and you will be amazed at what artists can do armed with a large log and a chainsaw. Take the kids to Landmark Forest Adventure Park to allow them to burn up excess energy on activities such as the tree-tops trail or the rollercoaster – a day out for all the family. Visitors to Carrbridge always leave with a photo of the famous 1717 packhorse bridge, built so that residents could carry coffins across the water when the river was in spate. During the summer months, hardy locals leap off the bridge into the icy depths below to cool off – not advisable to the uninitiated but a great spectacle. For nature lovers, the area has a range of habitats including parts of the ancient Caledonian Forest which are a haven for indigenous wildlife. Carrbridge is perhaps the best place in Scotland to see red squirrels as well as other wildlife including pine martens, red deer, Scottish crossbills, capercaillie, ospreys and golden eagles. And, if you're lucky, you may just catch a glimpse of the elusive wildcat. The City of Inverness, capital of the Highlands, is a half-hour's drive or train journey away where visitors can hope to catch a sighting of Nessie the resident monster who lives deep below Loch Ness. Six miles south of Carrbridge is the bustling village of Aviemore with a variety of shops, restaurants and leisure activities, as well as a cinema to keep everyone happy. 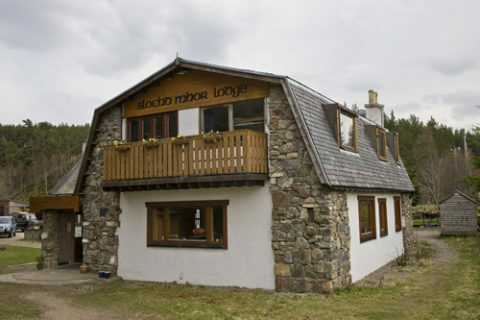 Carrbridge is also well-served with great facilities for a small village including a variety of B&B's, hotels and guesthouses, as well as a traditional Highland village pub and hotel bars each complete with roaring log fires and delicious home-cooked food. So come along to Carrbridge, hike it if you like. Come along to Carrbridge in your motor or your bike. You won't be disappointed and, at the end of your trip, will be deciding when you will next visit.